A few days ago I posted about my disappointment at the way the Salvation Army General talked about the massacre of the patrons of the Pulse nightclub. My disappointment lay in the fact that the General didn’t refer to the fact that the people killed appear to have been targeted because of their sexuality and/or gender. I was pleased to see the General referring to this event on Facebook today in a much more inclusive way. It’s wonderful to see that the LGBT+ community can be specifically named by the General as a group that has specifically been singled out for persecution. The only qualm I have about this post is that the General missed the fact that it’s not Fathers’ Day in Australia or New Zealand today. I think I can let that one slide! The General seems to be very careful not to mention one of the most obvious things about this emergency. If a church had been shot up, or a mosque for that matter, there would be a comment about how tragic it is that the people killed were killed, not for anything they’d done, but the mere act of worshipping their god in the way they see fit. A right we all take for granted… and so on. If the gunman had shot a hundred people at a footy match, the General’s speech would’ve had a comment about how tragic it is that these people were killed, not for anything they’d done, but for the innocent act of spending an afternoon watching sport. It’s something we all routinely do… yada yada. This is how these sorts of speeches go. The whole point is to describe the senselessness of the act and how any of us can be caught up as the victims of seemingly random acts of violence. This speech does that, but not really. The difference here is that the group of people targetted is a group that the Army would prefer didn’t exist. We can cope with footy fans. Many of us are footy fans. Or tennis fans. Or whatever. We feel especially concerned when it’s people worshipping who are targetted, even if they worship in a way completely at odds with our own faith and practice. Most of the people in this group go to worship on a weekly basis, and we empathise with those who are killed for doing so. However, as a movement we have no idea how to talk about the diversity of sexuality and gender identity, so we just pretend such things don’t exist. Our ‘positional statement’ about homosexuality was taken down several years ago for review, and we’ve given up waiting for a new one. If we ignore it for long enough, maybe it will go away. This means we don’t know how to empathise when a gay club gets shot up, even though—and this is really important when the General starts to talk about them: they are in our midst. They are Salvationists. They are Christians. When the General talks about us he’s also talking about Salvationists who dance in gay clubs because, generally speaking, they’re one of the few places you can go and not be judged or assaulted for your gender or sexuality. Some of us are also them. The fact that the General can’t bring himself to acknowledge the LGBTQ community apart from a vague reference to ‘cultural difference’ or ‘different beliefs’ (whatever the blazes that’s supposed to mean) speaks volumes. It is the very act of shunning which the General takes pains to tell us not to commit. We need to learn how to talk about such things. We also need to learn that, in the face of wrong and injustice, the only time silence is appropriate is when we’re listening to the cries of the victims. I’ve been following a thread in a Facebook group for Salvation Army officers. The original poster was wondering about the normal working hours for officers. What time do we start in the morning? What time do we knock off? A few officers gave a bit of an idea. Some start early—8:00, 8:30am. Others are responsible for getting children to school and don’t get in until after 9:00. Yet others said it depended on what else was going on. If they had programmes or other work activities that night or the night before they might start a bit later or finish a bit earlier. That’s all quite fair. However, there was one assumption that seemed to go unchallenged: it seems to be assumed that ‘work’ for an officer happens primarily in an office. The work day, according to this view, begins somewhere between turning on the computer and making coffee. For many that’s true. Officers in T/DHQ appointments, for instance, often have administrative roles and their work is primarily conducted from behind a desk. Even in a corps there’s always a lot of administrative work to be done. What I am questioning is the fact that the default setting for a corps officer in the 21st century is administration. What do you do on a wor k day when you have nothing else specifically planned? You go into the office. And do officey things. It’s as if our standing orders are to get to the admin block and look busy. Why don’t we default to something else? Is it that we have to be seen to be working? Do we have to be seen by our employees and other staff to be putting in just as much, if not more? Are we worried that we’ll be setting a bad example if we don’t? I remember hearing one Commissioner say that the most important thing an officer can do is turn up to work on time. Well, I question this. As I had to explain to someone once (on being questioned for not unnecessarily hanging around their workplace) my being an officer doesn’t mean I live in an office. Now, I get that admin is important. There will always be another email to reply to and another form from THQ to accidentally shred. But why is it the default? Couldn’t we put something else in there instead? There are always going to be corps folk who need visiting. There are always going to be books that need reading. There are always going to be biscuits to buy for the Home League. There are always going to be hospitals that need visiting. There are always going to be prisons that need ministry. There are always going to be homeless people who need a feed. There are always going to be kids at the local school who need help with reading. There are always going to be scales that need to be practised. There are always going to be Facebook posts that need to be made. There are always going to be weights to be lifted. There is always going to be furniture that needs moving at your thrift shop. There are always going to be playgrounds to take your kids to. There are always going to be people needing your prayers. There are always going to be sermons that need writing. There are always going to be assignments that need research. There are always going to be friends who need a chat. And yes, there are always going to be payroll forms to sign. Is there an O&R that says we have to do these things in our office? Not that I know of. Some of them are most appropriately done in the office, but some of them can be done outside as well. Some of them should be. I cannot work on a sermon at the office. I can study at the office, but not with people around. Funnily enough, I spend most of my office time out of office hours. Now please, don’t get me wrong—I’m not saying that corps officers shouldn’t spend time in the office. I’m not saying that admin tasks should be blown off. I’m not excusing tardiness and I’m certainly not condoning unreasonable laziness. I’m simply pointing out that officership isn’t a nine-to-five job and there’s no reason why we should fall into that pattern by default. I told a version of the biblical story of the Good Samaritan in our church newsletter that week, but instead of Levite, priests and Samaritans dealing with a Jew, it was Christians passing a Christian man by, and the person who stopped to offer assistance was a Muslim woman wearing a burqa. The book is divided into two parts. The first part, entitled The Jihad of Dajjal, looks at the history of ‘holy wars’ in both Christianity and Islam. It devotes a chapter to ‘holy war’ as waged by each tradition, then spends another chapter discussing the non-religious factors that lead to such wars, whether psychological, political or spiritual. This is followed by a discussion of the ‘closed set’ approach to religion (in which people are considered strictly in or out of the religion, generally by the application of rules and narrow credal statements) vs. ‘open set’ approaches, which tend to be less concerned with formally measuring a person’s adherence to the faith. Andrews posits that closed set approaches inevitably lead to violence and that open set approaches to religion are far more useful in building peace. Andrews is concerned to point out that both traditions have perpetrated great evil in the name of religion. He’s especially concerned to make sure that it’s clear that Christians have historically been just as violent as Muslims, if not more. This is one of the great strengths of this book: Andrews rarely gives an account of an historical event without offering an equally heinous or righteous event from the other tradition. This reminder to remove the plank from your own eye before worrying about the speck in your brother’s is especially important in a world in which striving after virtue has taken a back seat to merely being better than the worst examples of humanity one can find. The second half of the book looks at how Isa—in the Christian tradition, Jesus—waged Jihad. Christians generally don’t understand that Jesus is not only highly regarded within Islam, he is highly revered. The section begins by reframing Jihad as a method of non-violent struggle. It explains how humans are naturally non-violent and generally have to be taught to kill other human beings. The idea of Jihad (and its equivalent in the Western tradition) can be used to help train humans for battle, but that is really a bastardisation of the concept. Andrews continues the section with a chapter that shows how Jesus is an example—the supreme example, even—of non-violent struggle. Andrews is very careful to limit his observations of Jesus to things that Muslim and Christian alike can agree on. This ‘common ground’ approach is both wise and practical, and by itself this chapter could prove to be a good resource for anyone of either tradition who wishes to begin dialogue with people from the other. The final chapter of the book provides four historical ‘case studies’ of Christians and Muslims who have chosen the way of peace, even when it proves costly. In each case Andrews highlights various ‘dynamics of Jihad‘ that are evident in each story. The book concludes with a meditation on the Beatitudes and shows how that famous list of blessings transcends religious boundaries and finds itself at the core of all religious tradition. I am glad for the opportunity to read this book. It was very well structured, both at the level of the broadest outline right down to the individual paragraphs. The reader is never left unsure of where the argument is going, which makes a pleasant change from a lot of the philosophy and theology I’m used to reading. There’s little extraneous material—it’s all there for an obvious reason. If I have a complaint, it’s that the author seems artificially removed from what he is writing. It’s clear that he has a lot of experience in Christian/Muslim relations, and there are many personal anecdotes in the book, yet it has something of the feel of an academic book in which the author is careful not to let his or her voice come through too much. I probably would have enjoyed the book a bit more if Andrews allowed himself to relax a little more. When I came to the book I had one question I hoped might be answered. I think this book has supplied the material to answer my question, but I don’t want to cause any offence by getting the wrong answer. It’s this: Does the term Jihad mean something similar to what The Salvation Army means by War? Can I use the Islamic concept of Jihad to apply to what the Salvationist undertakes as a Soldier of The Salvation Army? I can see how the terms might be related, and Andrews’ description of Jihad in this book looks like a very useful way of approaching my own tradition’s eponymous metaphor. But I don’t want to appropriate a term inappropriately, as it were. I’d be glad to hear from anyone who can help me with an answer to this question. Lastly, who would I recommend this book to? I doubt it would be of any interest to anyone who isn’t committed to non-violence. However, it provides useful tools for thinking about non-violence and peacemaking, even for people who have no immediate interest in or need for inter-faith dialogue. Mostly, it can provide a starting point for Muslims and Christians who want to sit down and learn from each other. Sadly, it seems to me that there aren’t too many people who want to listen to people they’ve been taught to fear and hate. Disclosure: I received this book free from the author and/or publisher through the Speakeasy blogging book review network. I was not required to write a positive review. The opinions I have expressed are my own. I’ve been listening to the Homebrewed Christianity podcast for some years now. The HBC format is fairly simple, generally consisting of an interview with an author or theologian and discussing their particular brand of theology. The interviews can get fairly technical, but they’re meant to be accessible for anyone who likes discussing ideas. The idea is that listeners are given the ingredients to brew their own theologies. It’s more a discussion at the local pub with your uni mates than it is a lecture. The hosts of the show consider the interviews as a chance to ‘nerd out with your geek out.’ That sums it up perfectly. There are a few different shows and formats in the HBC ecosystem, but the latest addition is a line of print books published by Fortress Press. 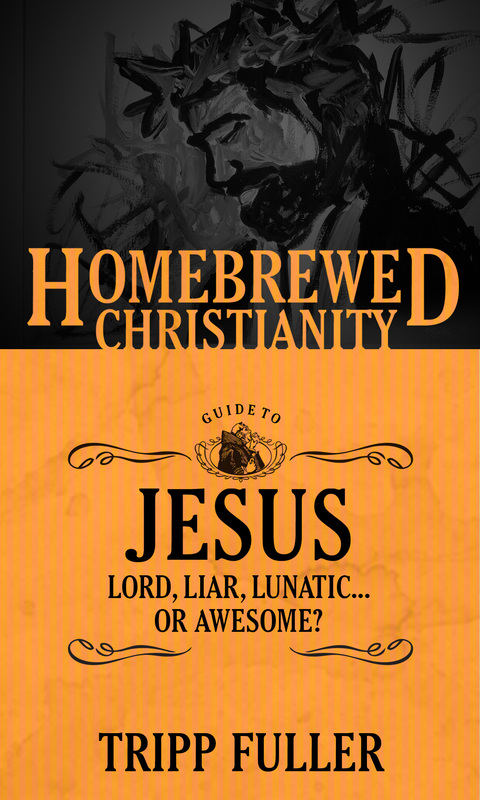 The first of these books, written by the HBC host Tripp Fuller, was published in November 2015 and is entitled Jesus: Lord, Liar, Lunatic… Or Awesome? This book gives an overview of how issues involved with the academic study of Jesus in the twenty-first century. It begins with a chapter discussing the possibility of studying Jesus, and, drawing on the work of Søren Kierkegaard, covers the critical roles of faith and skepticism in doing Christology. The second chapter discusses the historical Jesus—a homeless Jew who lived in the first century—and the context in which he lived. There’s also a discussion of the possibility of saying anything definitive about Jesus from the twenty-first century and some of the problems that invariably pop up when we do. The third chapter is about the message Jesus taught about his Kingdom, although Fuller argues that that term isn’t particularly useful anymore, and modifies the word to ‘Kin-dom’ to highlight the filial aspect of those in God’s family. The fourth chapter was an excellent summary of the four biblical gospels and the differences between them. I’ve been studying the Bible formally (in an academic sense) for many years now, and there’s nothing here that’s particularly new, but the summary was full of insights that have already borne fruit in my preaching a week after reading the book! There’s a rather important point to this chapter as well—if we can have four biblical views of Jesus that differ so much in both the details and overall picture of what he was about, there must be some room to allow different views of Jesus to propagate in the church today. The fifth chapter is about the incarnation. It uses the work of Anselm and Luther to introduce some of the more philosophical and theological topics in Christology, like the incarnation and atonement theory. I’m not sure if this approach has more explanatory power than anything else I’ve ever seen, and I’m not sure it’s particularly novel, but it was able to skirt around the debates and metaphysics of the fourth and fifth centuries, which I’m rather grateful for. The discussion of cooties and their source has been invaluable—I too agree that they derive from the cootie gland, an anatomical feature specific to girls. The next two chapters compare the high and low trajectories of Christology. Rather than settling on one as the preferred approach, Fuller sees value in each and is content to allow the reader to make up their own mind. The final chapter returns to the discussion of faith and skepticism begun in the first chapter and looks ahead to the sort of faith and practice that will be needed in the centuries to come. I thoroughly enjoyed this book, just as I do the podcast and for the same reasons. Whilst Fuller has his own conclusions that he’s rather fond of, and which he’s keen to spruik from time to time, he’s more interested in giving the reader the tools they need to work out what they believe in the context of their own journey and tradition. Like the podcast, the book has the feel of a late-night bull session at which ideas are played with rather than imparted as facts to be assimilated in a lecture. This conversation feel is heightened by four characters in the text who pop up in sidebars rather frequently to add their own two-cents to the discussion. I thought this would be rather annoying after the first few pages, but it actually gives the reader the feeling they’re actually in a pub doing theology. Probably the one thing I was disappointed in was the physical printing of the book. I happened to get a drop of water on one page and the ink actually smudged, like it had been printed by the cheap bubble-jet printer on my desk at home. This is only a minor thing, but I would suggest that readers are very careful if they want to read this in the bath! If your Christology isn’t weird, you’re doing it wrong. The church’s theological confessions about Christ are not suddenly embarrassing; they always have been. Join the parade! It’s not like it takes a pluralistic culture informed by science to realize that identifying a dead homeless Jew as the Son of the living God is absurd. It is. Let’s own it. But instead of just regurgitating it without reflection and throwing it at our befuddled neighbors as a trilemma with eternal consequences, let’s let the weirdness seep into our own imaginations. All in all, this was a good book that I’m going to be sharing with the theonerds in my life. 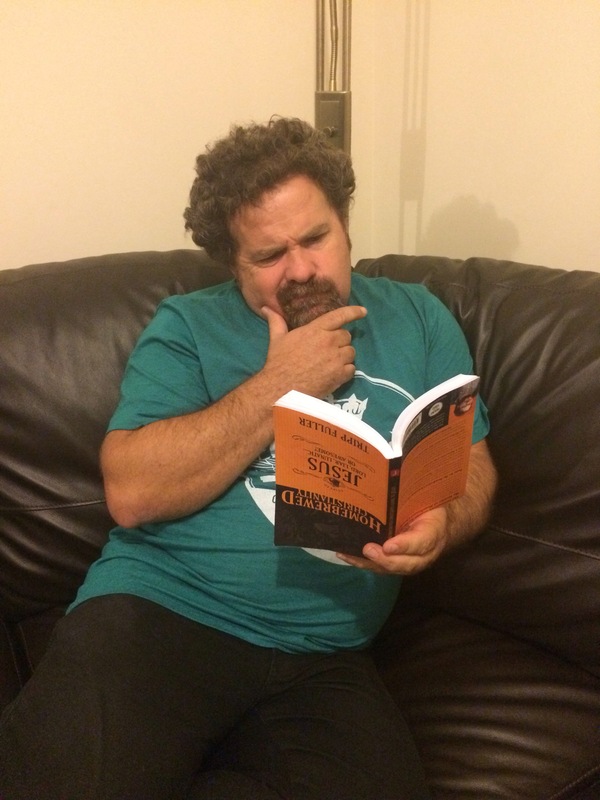 I got my copy from the Book Depository, but I believe it’s also available from Amazon and it can also be purchased directly from Homebrewed Christianity. A few days ago I got involved in a rather nasty Facebook conversation. I’m not going to get into the details, but I was strongly reminded of something that happened to Jesus. A lot. I think we all get the story. 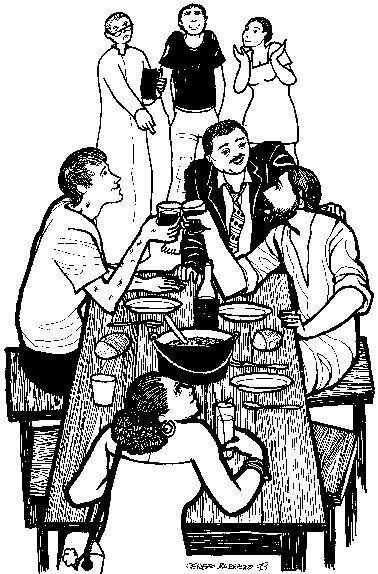 The Pharisees are criticising Jesus for eating with the wrong sorts of people, but Jesus points out that, just like healthy people don’t need a doctor, good, moral people don’t need Jesus. Or, at least, the apparently immoral need him more. Let those with ears hear. Back to the Facebook discussion. A group of people think that I, and some of my friends, are doing ministry the wrong way. They’re concerned that we don’t hate sin enough. Apparently we should be telling all of the sinners around us to stop sinning, and to do anything less is an abrogation, not only of our duty as Salvation Army officers but as disciples of Jesus. The fact that I have friends who are still sinners offends them. These people sound just like the Pharisees looking through the window of Levi’s house simply to find something wrong with what we’re doing. But you know what? I got to thinking that Jesus’ comment about the ‘sick needing a doctor’ needs to be reinterpreted. I’m starting to think that Jesus didn’t go to bring healing but to find it. He was talking about himself. That’s right. Levi and all of his sinner friends were like doctors to Jesus. Jesus was fed up with the self-righteous crap that the Pharisees dumped on him all day. He needed somewhere to clear his head and find a bit of normality. It’s not like the Pharisees were evil, exactly. They meant well. They were very concerned about sin. About holiness. About offending God. And they were really keen to make sure people didn’t upset God. 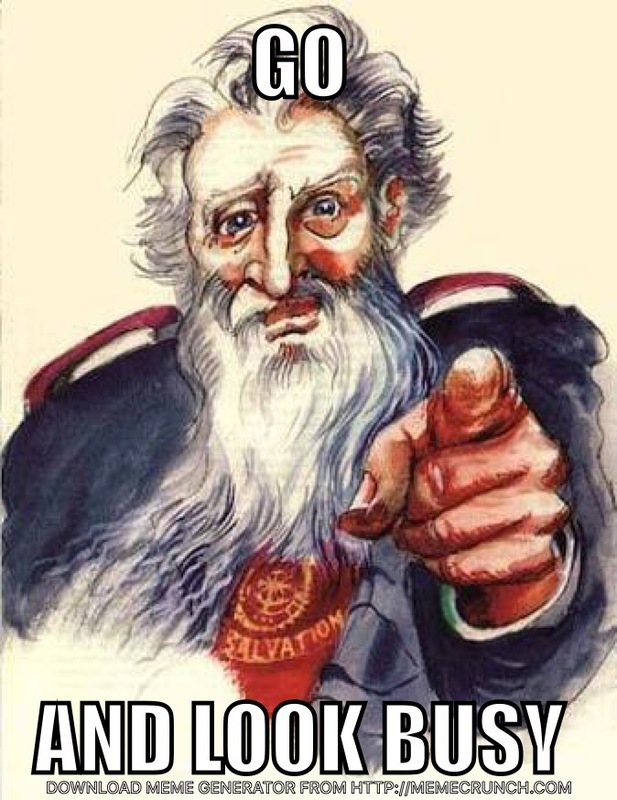 Upstart preachers like Jesus should do the same. If Jesus was as loving as people say, he’d be telling them all how much God hates their sin. But instead, he goes to tea with them. Drinks wine with them. And asks them to hang out some more. The Pharisees couldn’t handle that. Jesus had to be corrected (in love, of course.) He was a false preacher. He had no business calling himself a righteous Jew. If he had any integrity at all he should get out of the way and let the real preachers in. The only people who weren’t telling Jesus to pull up his socks were the drunken, whoring, cheating sinners at Levi’s house. These people did Jesus’ soul some good. And I think I know exactly how Jesus felt. The people I prefer to associate with don’t go to church. Some of them would love to, but they’re scared they won’t be welcome. They’re too gay, too drunk, too mentally ill. Their sins aren’t acceptable in church. Do they really need go to church to be reminded of how bad they are? Do they need people to lovingly come at them with Bibles blazing all barrels? It’s an unfair caricature, I know. But it only takes one person to properly do your head in. So go away, Pharisees. I don’t need your style of love and care. I need a doctor, and these guys are it. Today I had a mystical experience. I bumped into my friend Horace (name changed to protect the innocent!) outside our church hall. Horace and a few of his friends like to hide behind the hall and drink sometimes, and he’s always passing through our property. Over the last year or two I’ve come to know Horace quite well. Now, I’m not that well acquainted with Maori traditions, but I know enough to know that a hongi is a form of greeting involving rubbing noses and foreheads together. It’s more than just the Maori equivalent of a handshake though. It involves exchanging breath, which is a rather intimate act. I believe this has something to do with joining each others spirits together. If any of my Maori friends and whanau out there can explain further, I’d appreciate it! So there were Horace and I touching faces in a way that some might find awkward. Two things happened. First, as I shared Horace’s breath I couldn’t help but notice how fruity it was. It wasn’t objectionable. It was sweet yet tart, like a cheap Moselle or a Riesling. It probably was. I didn’t hear the voice with my ears. It was inside my head, but it was as clear as anything I’ve ever heard. Horace shook my hand and walked off, just stopping to turn and yell “WILLIAM BOOTH! GOOD GUY!” as loud as he could. I couldn’t help but think of the opening chapters of Genesis, in which God creates a creature out of dirt and puts his breath into it, making the first human. The word for ‘breath’ in the ancient texts is the same as the word for ‘spirit.’ God imparted life to our first ancestor by breathing spirit into a bit of dirt. I wasn’t breathing the fumes of Horace’s liquid breakfast. Horace wasn’t breathing the consequence of my not having time to brush my teeth before I left home this morning. We were sharing the Spirit of God. We were imparting life to one another.